Blurb: In a riveting novel rooted in one of American history’s great “what ifs,” Jim Lehrer tells the story of two men haunted by the events leading up to John F. Kennedy’s assassination. November 22, 1963. As Air Force One touches down in Dallas, ambitious young newspaper reporter Jack Gilmore races to get the scoop on preparations for President Kennedy’s motorcade. Will the bubble top on the presidential limousine be up or down? Down, according to veteran Secret Service agent Van Walters. The decision to leave the top down and expose JFK to fire from above will weigh on Van’s conscience for decades. But will it also change the course of history? Five years after the assassination, Jack gets an anguished phone call from Van’s daughter Marti. Van Walters is ravaged by guilt, so convinced that his actions led to JFK’s death that he has lost the will to live. In a desperate bid to deliver her father from his demons, Marti enlists Jack’s help in a risky reenactment designed to prove once and for all what would have happened had the bubble top stayed in place on that grim November day. For Jack, it’s a chance to break a once-in-a-lifetime story that could make his career. But for Van the stakes are even higher. The outcome of a ballistics test conducted on the grounds of a secluded estate in upstate New York might just save his life—or push him over the edge. 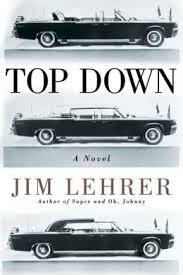 A page-turning historical novel with the beating heart of a thriller, Top Down could only have sprung from the fertile imagination of Jim Lehrer. Drawing on his own experience as an eyewitness to the events described, one of America’s most respected journalists has crafted an engrossing story out of the emotional aftershocks of a national tragedy. Review: I received a e-galley of this book through NetGalley. Here’s the deal, guys, I am a JFK junkie to the core. It’s nearly an obsession, really. So with 2013 being the 50th anniversary of the assassination, you can imagine that there are a ton of books coming out this year that have to do with JFK and the assassination – both fiction and non-fiction. Already this year, not including this book, I’ve read one fiction book (The Man from 2063) and I have another non-fiction book lined up through Edelweiss. I am in hog heaven! Okay but seriously, I guess I need to get to the actual review of this book. This book definitely has a different feel from any other book I’ve read recently. I don’t know, it’s kind of hard to describe. Part of me felt as if I was reading a memoir at times. I actually had to look up the info on it after reading the first chapter to see if I was reading fiction or non-fiction. But don’t let that scare you off, because the book reads quite easily. And it is fiction. The cast of characters in this book, oh what a great bunch. First you have Jack, who is a reporter who actually reported on the Kennedy assassination from Dallas. In the beginning he describes a conversation he had with a Secret Service agent, Van, the day of the assassination regarding the bubble top on the presidential limo. Van made the call that the bubble top was to be removed (I must add that this is where I originally thought I was reading a memoir). That was the beginning of the end for Van. From there you meet his daughter, Marti, who is convinced her father is dying because of that one decision and how it affected him. All she wants from Jack is to help her prove to her father that his decision had nothing to do with Kennedy’s death – Oswald still would have taken that shot and Kennedy still would have died. What this book really and truly is about is human emotions. Van is a broken man after the assassination. He blames himself for Kennedy’s death. But it doesn’t just end there. It turns his wife into an alcoholic and his daughter gets pushed away to boarding school. One little psychological break doesn’t just affect the person who has had the break … the whole family is impacted. Guilt is a very powerful emotion. And being through something as traumatic as a presidential assassination would do a number on any person. Overall I definitely recommend this book to anyone who enjoys anything JFK. Those who like historical fiction would probably enjoy this one as well. Past that, it might not appeal to just everyone. But overall definitely a book that I enjoyed to feed my JFK obsession. I am not a Kennedy junkie but am fascinated by the family. We saw the movie The Butler and it was fun to see all of the presidents, JFK included.